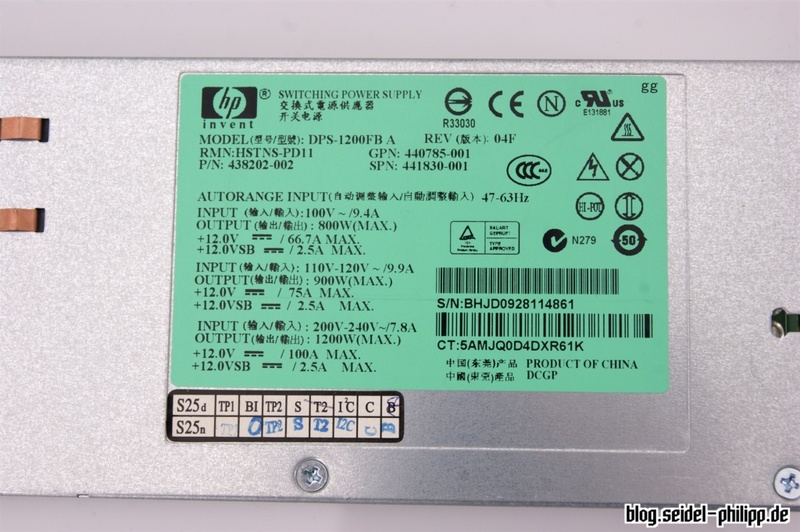 In this guide, you will learn how to modify the HP DPS-1200FB (A) power supply to use with a LiPo charger or 3D printer. 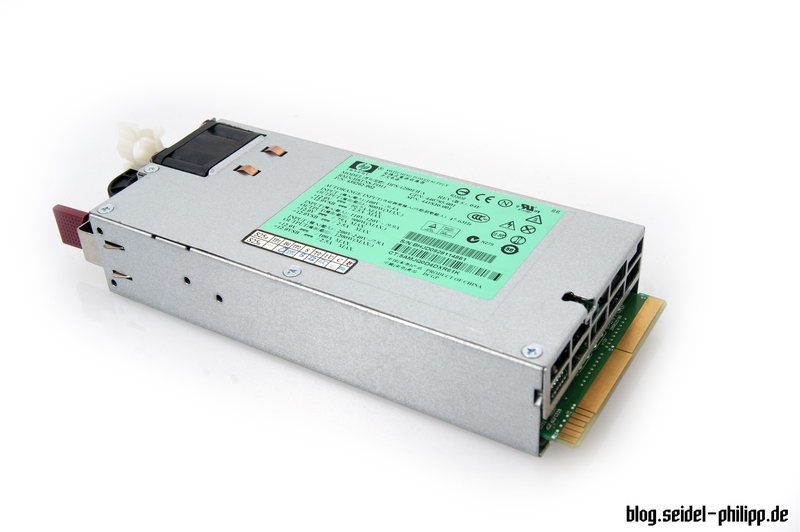 The HP DPS-1200FB is a server power supply with extremely high performance. It offers up to 100 amps at a voltage of 12 volts. 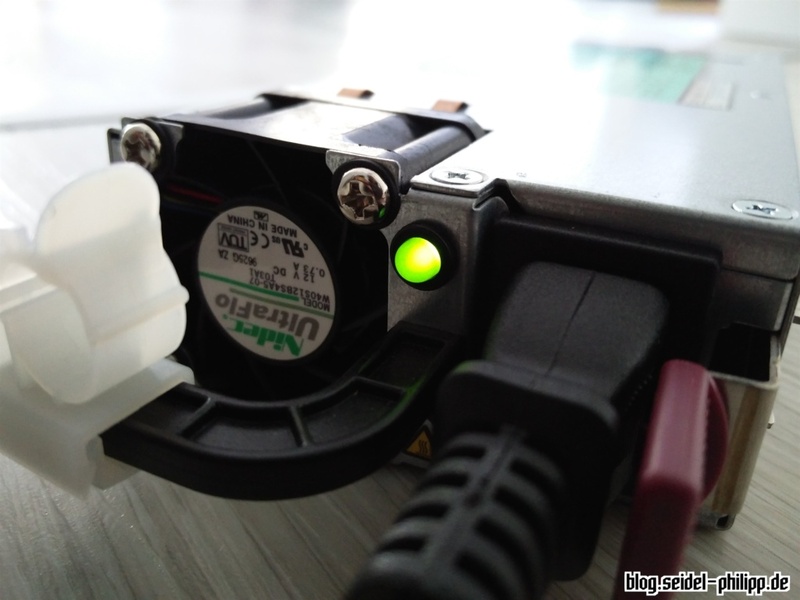 Therefore, it is particularly suitable for the power supply of high-powered chargers. It is usually operated in server farms and pushed into the server racks. 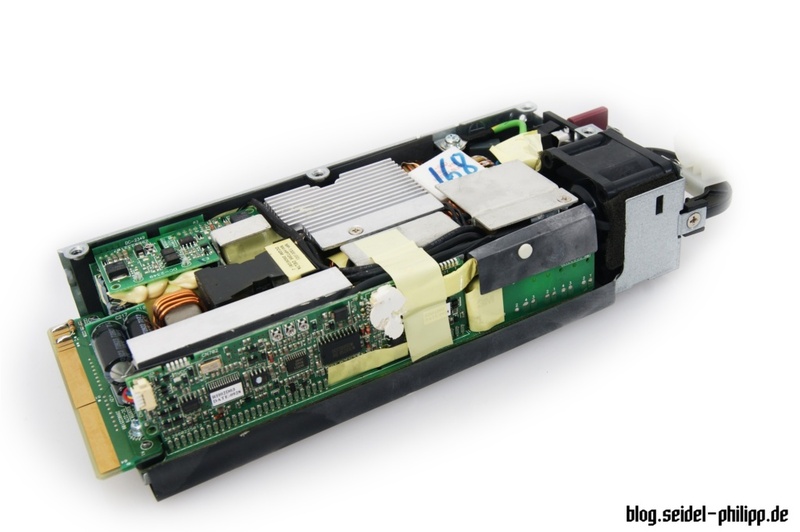 Therefore, we have to hack the power supply to be able to operate it. Incidentally, I have previously converted an old computer power supply which gave me 25 amps at 12 volts. 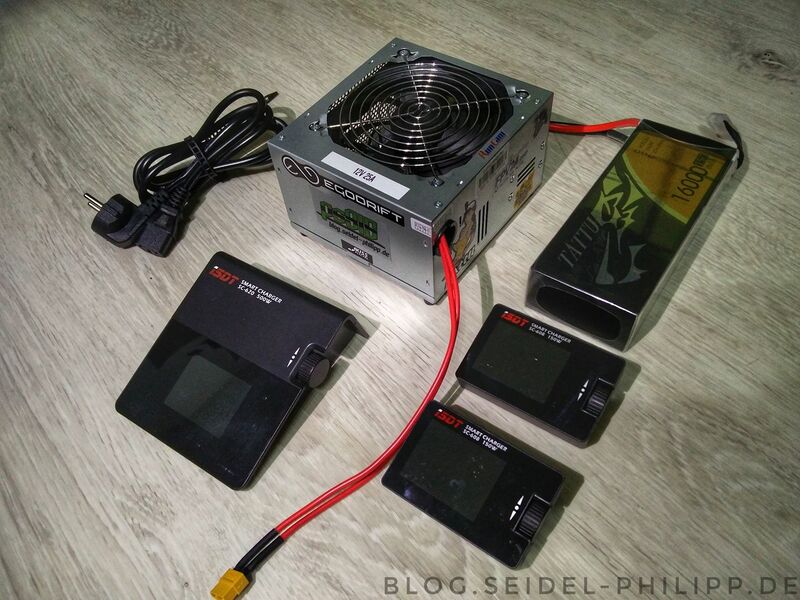 The goal was to charge the Tattu 16000mAh 4S Lipo Feldakku in an acceptable speed (with the ISDT SC-620). You will find a brief guide as a text in the picture description on Facebook. 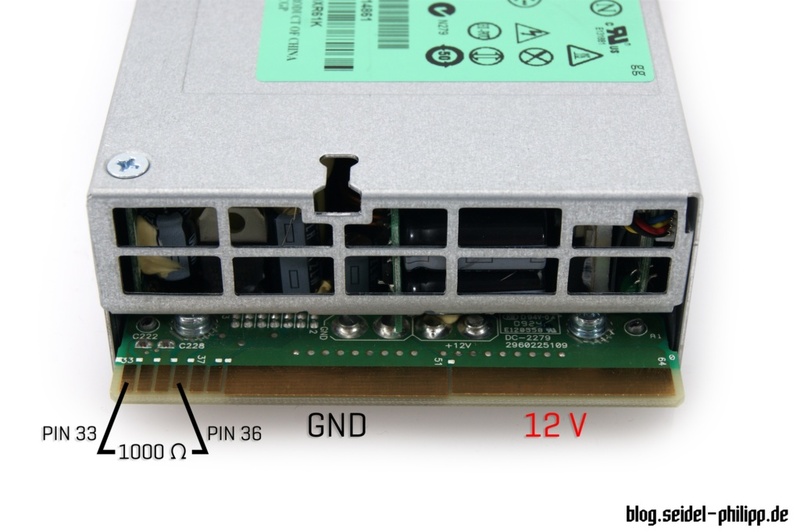 If you look at the top of the power supply you can find a series of connections. 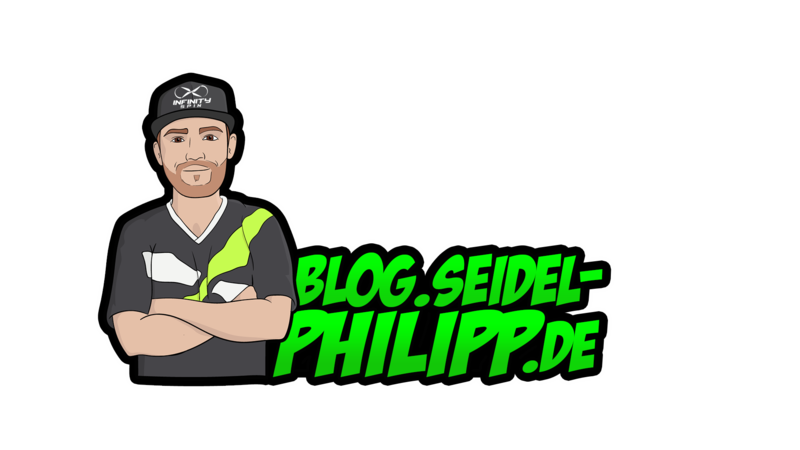 We are interested in only the PIN33, PIN36 as well as 12 V and the GND connection. On the back are further connections, which are also not of interest to us. If you plan to operate the power supply at the limit and want to get very high currents, you should solder 12V and GND down and above (exactly one above the other) to distribute the load evenly. The first thing we need to say the power supply that we have pushed it into the appropriate bay in the server. 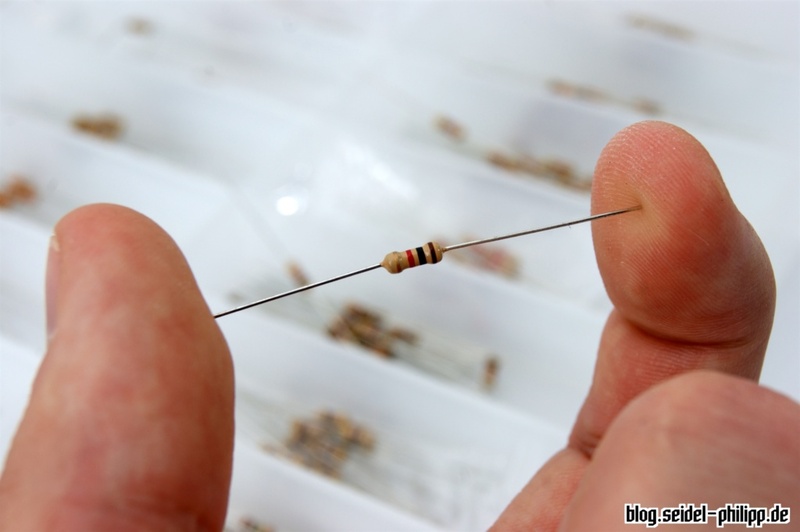 This is relatively simple by soldering a resistor. We provide the contact surfaces with a little solder and we do not create a short circuit between the adjacent pads. Next we look for a suitable resistor. You can solder a resistor between 330 Ω and 1000 Ω. I have a Conrad-Box with various resistors. You can fold both legs of the resistor directly at the resistor, the dimension fits perfectly for the two soldering surfaces. The legs you should be shortened a little. Now place the resistor flat on the pretinned pads and solder it. Afterwards, I have bent the resistor up, so that he has no contact with the circuit board. 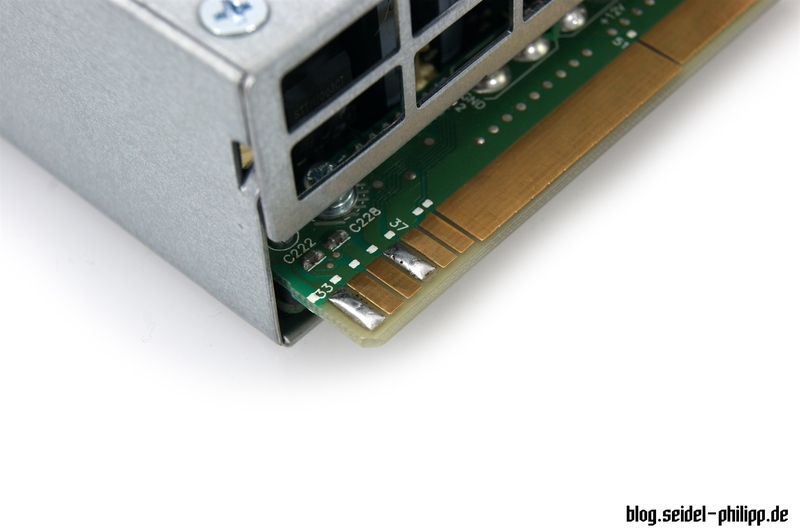 If everything is correctly soldered, you can plug the power supply into the socket for the first time. 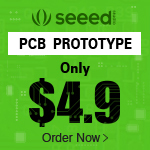 When the green LED lights up, the power supply is raised and now supplies 12 V voltage. 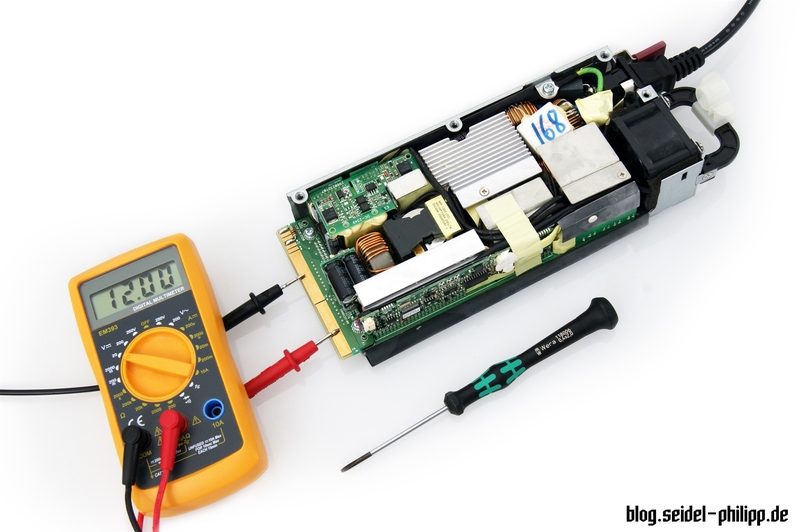 With a multimeter, you can now test whether the 12 V is really applicable. 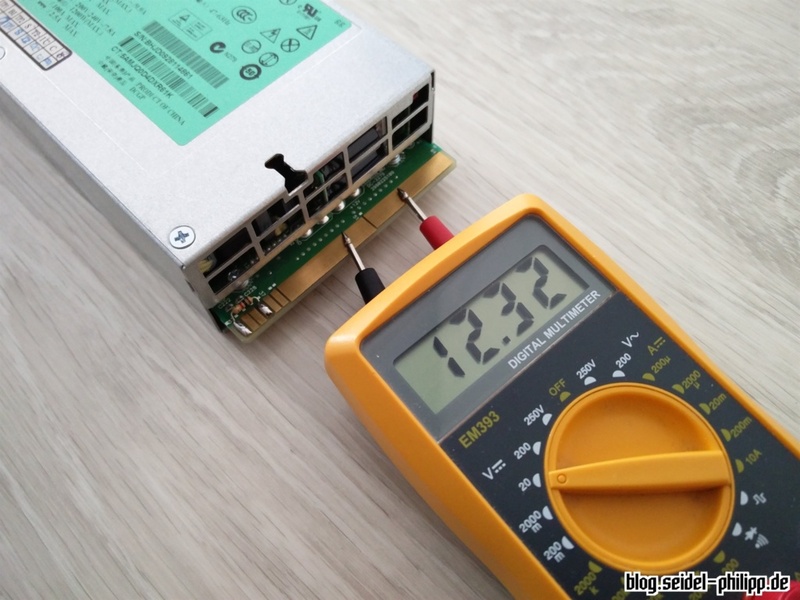 As can be seen in the picture above, the power supply provides slightly more than 12 V. For our chargers this is usually not serious, because they can usually be operated with significantly higher voltages. 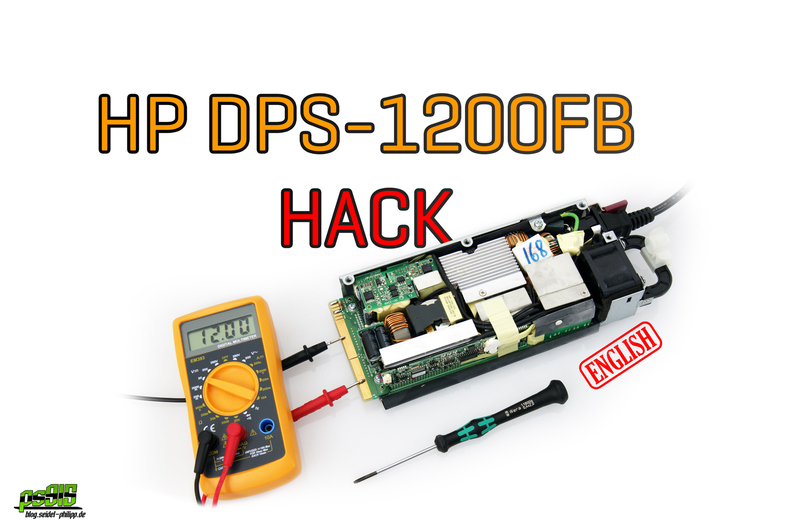 However, if you want to use the HP DPS-1200FB for other things like a 3D printer and need exactly 12V, there is a possibility to set the voltage precisely to 12V. 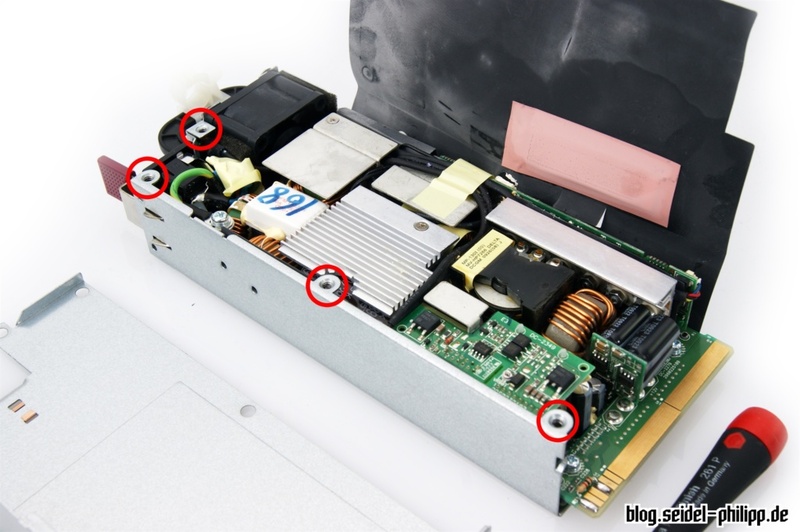 Note that 220V may be present in the interior of the power supply. If you are unsure to do it yourself or you are not expert, you should call an electrician. I accept no liability for any damage that may result from this tutorial. Do not operate the device when it is opened. 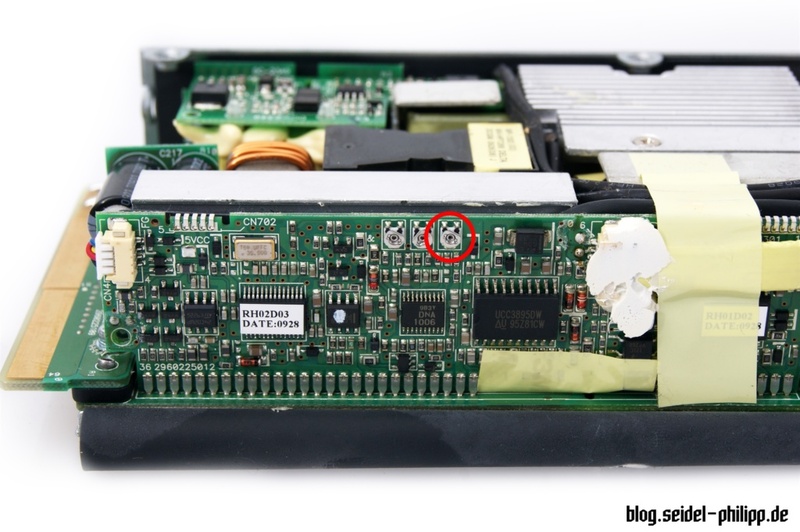 You can open the power supply by removing the 4 marked screws. Then remove the black insulation. The insulation can be glued. You can fold the insulation and push it under the device. Then you should see the following board on the side of the device. Rotate the marked adjustment wheel to fine-tune the voltage. If you turn counterclockwise, the voltage will increase. Afterwards, we check the voltage with a multimeter and, if this is correct, can re-assemble the power supply. The power supply is now ready for use. 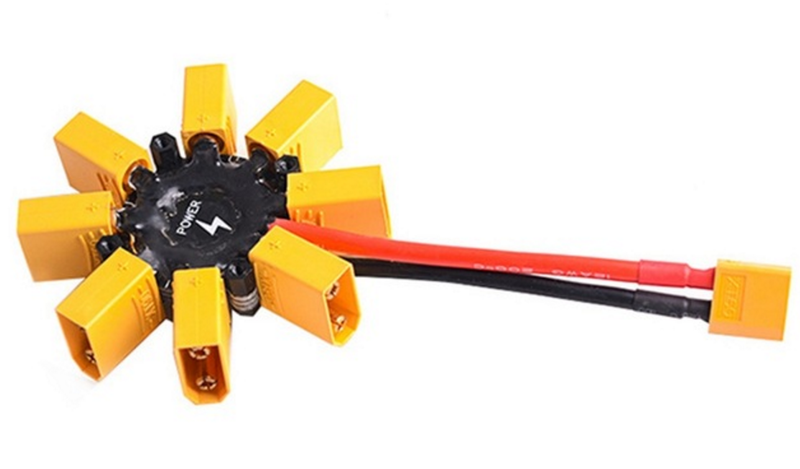 To power more than one device, your can use these kind of Power-Hubs.